There aren’t any directions on mounting the mirrors to the carbon fiber aeroscreen so used Daniel French’s pictures as my guide. The aeroscreen attaches to the sides of the car where the windscreen would attach with two hex head bolts then rests on top of the scuttle at about a 45 degree incline. Getting it on and off is simple and can be done with one person. 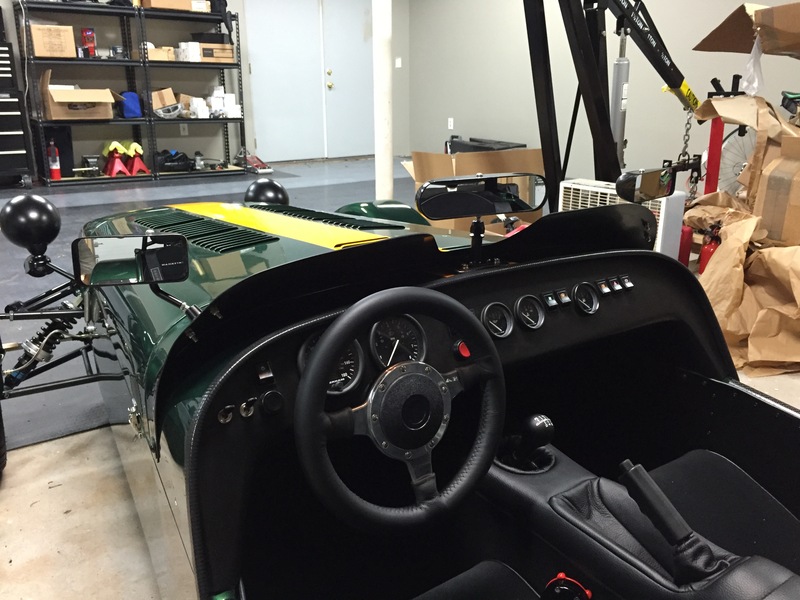 The first challenge with mounting the mirrors is the aeroscreen curves in 3 dimensions to scoop air up and also to roll air to the sides of the car. It works wonders while driving – there’s very little buffeting or wind noise in the car – but makes it challenging to get the mirrors attached because the mirror base never sits flat on the aeroscreen at any point. Why they don’t curve the base ever so slightly I don’t know as I think it would produce a better fit. The other challenge is lining up the mirrors from one side of the car to the other. Getting one mirror positioned is straightforward, you just lay down some blue painters tape and then position and mark for drilling, but to get the second one to line up is a bit more difficult. 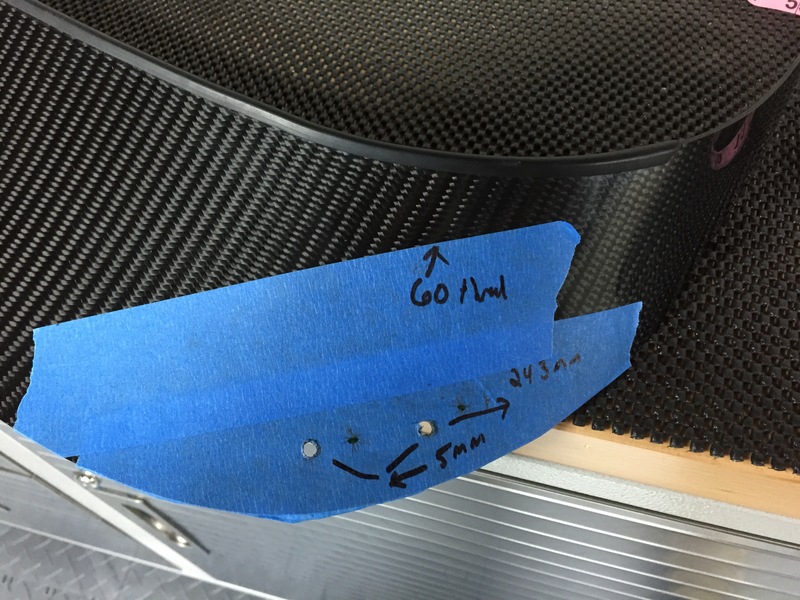 What I found that worked was to count 60 “threads” in the carbon fiber from the bottom edge where it mounts to the car in the carbon then make the first mark. Next, put the mirror base down and measure 5mm from the closest point (it’s a diamond shape) from the mirror base edge to the curve of the aeroscreen. Then measure the bottom of the base to the edge of the scuttle where it meets the body panel (holding the tape measure vertically) and you should be roughly 243mm from that seam. The real tip came from Kim – you can check your measurements by counting the threads in the carbon fiber from the center of the aeroscreen and from the edge of the aeroscreen where it bolts to the car and position the mirrors using the same count on each side. You can see how far I was off with relying on eyesight in the pic below vs Kim’s idea of counting the carbon fiber thread. I started with a 1/8″ drill bit then progressed upward from there to a 11/64″ drill bit (I think, measure your bolts to be sure), using each drill bit size one step at a time. The holes came out flawless. Next up was to mount the center mirror. To do that I had to take off the aeroscreen as I didn’t feel comfortable drilling directly down into the carbon fiber with the metal scuttle right underneath. The center mirror uses a triangular base and the mirror stalk is oval and designed to be facing in a certain direction – I didn’t realize that at first but caught it before drilling started. The other thing to decide is which way to put the triangle – do you do two holes towards the front of the car and one rear or put the triangle facing forward and the base of the triangle towards the rear with the tip pointing into the wind? It’s behind the aeroscreen and doesn’t matter; it’s purely an asthetic choice. I opted for doing the tip pointing towards the front of the car and putting two holes between the popper bases on the aeroscreen. The popper bases were pre-attached on my build since I’d ordered the car from the factory with the screen. To mount the center mirror rivets are used per Derek at Caterham – I didn’t have any with the mirror but had a bunch left over from the build so just re-used what I thought would fit. I believe they are the same 1/8″ rivets from the body panels and transmission cover. The aeroscreen curve makes it difficult to drill from the top of the aeroscreen base downward so drilled from the bottom up – just be careful on the forward hole that you don’t drill too far or you’ll drill into the carbon fiber aeroscreen curve! Ask me how I know – luckily I realized it in time and didn’t go all the way through, just a little nick. To mark the holes I used the same process – count the threads in the carbon fiber, mask with blue tape, mark the holes, then drill. I’d highly suggest marking the rear holes first, then riveting those, then drilling the last one. I drilled all three at once and the third hole was slightly off. Rather than re-drill I attached the rivet which lead to a little crack forming laterally across the aeroscreen base. You can’t see it and the structure of the carbon fiber is fine, just this hairline little crack that appeared. Not ideal, but I can live with it (Kim didn’t even notice it until I pointed it out to her, it’s really that small, but I kind of want things to be perfect ya know?). When riveting you need to rivet from the bottom upwards so the thin flat part of the rivet is on the bottom of the aeroscreen – otherwise there won’t be enough clearance between the scuttle and aeroscreen since the base of the rivet is too large for the gap. As Daniel French mentioned, the bolts are a little long and I’ll replace those eventually. They’re 16mm long now and you need something about 10mm long. Also, don’t over tighten them or you’ll crack the aeroscreen. When you see the aeroscreen curve start to deform a tiny bit stop there. Look closely and you can see what I mean about the curve bending from the flat base from the picture below. You’ll also want to tighten each of the bolts at the same time, doing each one a bit then swapping back to the other so the mirror lays flat. Another note – I didn’t drill the third hole for the adjustment as Daniel did on his – I was actually lucky and got them lined up without any fuss the first go around.